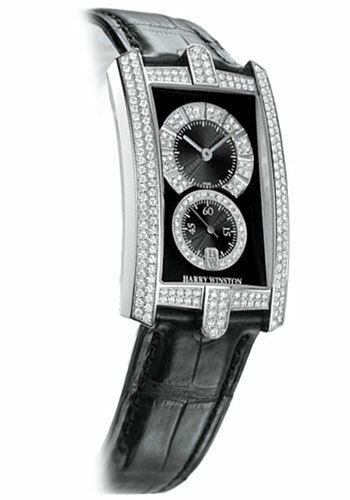 26 mm x 46.1 mm 18K white gold case paved with diamonds (2.03 carat), black dial with diamonds, quartz movement, black alligator strap. 26 mm x 46.1 mm 18K white gold case set with diamonds (3.98 carat), mother of pearl dial with diamonds, quartz movement, white alligator strap. 26 mm x 46.1 mm 18K white gold case paved with diamonds (11.02 carat), diamond paved dial, quartz movement, 18K white gold bracelet paved with diamonds.